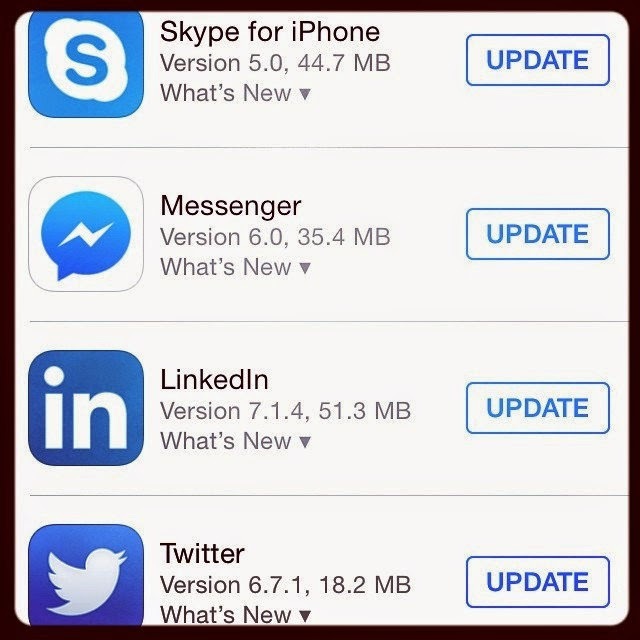 Why Should I Do Updates ? It’s actually very important to update almost everything on your computer and device. For two very good reasons. First every program or OS, operation systems, all have bugs. While developers try their best to write perfect programs, there will always be issues when millions of users jump on them at once. So constantly fixing is the only way to insure users can have the best operating experiences. Second, like it or not, all programs, apps and OS, will grow, or change slowly in times, especially their interfaces. This is the part on which most seniors dislike updates. Updates means changes and changes require relearning; this is just something users of my parents’ age do not love to see. Why can't things just stay the way they are? I don’t have a great answer for this, but one thing I know is that changing comes slowly, and if you always update when it needs, you will not feel that much of changes, almost like watching your children grow up. But for their clothes shrinking bit by bit, there is no way to know they grow that fast. When to update? For Apps, softwares, and browsers, do the update as soon as they ask you. If you are not familiar with the process, ask your helper to check updates per season. For OS on smart devices, such as iOS, and Android, do the upgrade after one or two months you see the notice. Why? All updates potentially create new bugs, and since OS updates might affect users more, the best way to avoid any unnecessary issues is to let other fashionable people try the updates first. By the time we jump in, most serious issues should be all fixed. Read related article: What Is “App” ?